Finding gluten free survival food supply is incredibly challenging, especially when trying to find something that doesn’t compromise on taste! 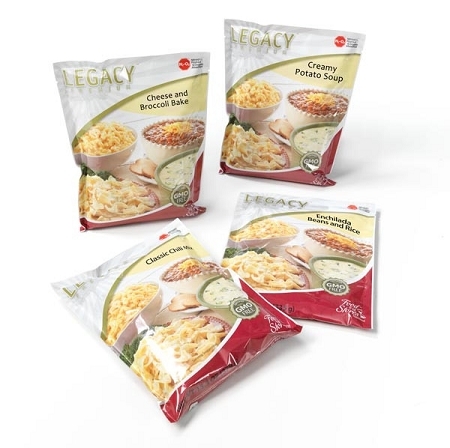 Legacy Premium is the first gluten free emergency food storage that truly tastes great, is full of healthy ingredients, and comes in hearty serving sizes at the lowest cost per calorie. The 16 Serving Gluten Free Sample Pack allows you to sample 4 different gluten free, non-GMO meals that will make a great addition to your emergency supply. Because Legacy Premium’s facilities are strictly monitored, we are confident in their claim that their gluten-free options are free of contaminants and safe for those who suffer from gluten allergies, sensitivity, and intolerance. Provide for all your family members’ specific health needs by trying this 16 serving sample package today. Legacy Premium has carefully crafted each gluten free survival entree to taste like an everyday meal but contain no gluten. For those who suffer from Celiac or gluten intolerances, these survival meal packs are a wonderful way to ensure that during a stressful emergency situation, you will be able to eat a healthy, hearty meal and not worry about what is going into your body. Enjoy the peace of mind that comes from knowing that you have plenty of gluten free meals on hand that will last up to 25 years in your prepper survival supply. Order a sample pack today and taste the delicious, gluten free survival food that only Legacy Premium can provide. PROVEN 25 Year Shelf Life! Legacy Foods has taken all of the necessary steps to ensure that the dehydrated and freeze dried meals will be fresh, healthy and full of flavor when you need them most. Forget about having to rotate your food storage! Legacy Premium Food Storage uses only the highest quality ingredients when making food and packaging to ensure that it will stand the test of time. Residual oxygen levels in the food are key to determining how long it will last. Legacy Premium uses superior packaging products and technology to ensure that their residual oxygen levels are the LOWEST in the industry! With superior Mylar pouches, oxygen absorbers used in addition to a nitrogen flush, and kept fresh in heavy duty BPA-free, resealable plastic buckets, Legacy Premium provides the gold standard in food storage shelf life! Extensive research and blind taste tests of ALL of the leading emergency food brands have resulted in a clear #1 leader – Legacy Premium Foods! Legacy was selected as the best tasting by 4 out of 5 consumers in the blind taste test research. Legacy Premium Foods has partnered with Honeyville, Inc. to provide incredible tasting food storage. Honeyville has been producing grocery quality food for over 50 years, and that shines through when you taste the flavors, variety and gourmet meals. Better yet, you will NEVER find GMO’s, MSG, canola oil, trans-fats or high fructose corn syrup in any of our products! FREE Shipping on ALL Legacy Orders – Any Order, Any Size! Cheap Treasures offers 100% FREE domestic shipping on ALL Legacy Foods orders! A UPS tracking number will be emailed to you upon shipping so that you can track your order while it is in transit. For orders weighing less than 500 lbs, your orders will be shipped via FedEx to your doorstep in unmarked brown cardboard boxes for your protection and privacy.